This is a scenic trail along the shores of Lake Jackson, the largest natural lake in Alabama. The trail is even-surfaced and is asphalt with wooden boardwalks built over wetland areas. Benches and picnic tables are scattered throughout. From Montgomery, AL: Two routes are available. (I) Take 1-65 S, exit 114 (Georgiana) and go west or south on AL-l06, US-31, AL-55, AL-l 00, US-331, and AL-55. (2) US-33 I south from Montgomery, then AL-55 S. Park at the Florala Wetlands Park. Fowl/Wildlife: Lake Jackson is home to at least one pair of bald eagles. The bald eagle was first sighted here in the mid-nineties. Their majestic appearances are sure to be a memory you won't soon forget. The arrival of coots heralds the end of warm summer days. Their numbers are so they appear as a mass of black on the lake. Just as quietly as they arrive, they leave during spring until the next cold season. The occasional heron graces the shores. Local walkers were enthused to witness the expansion of one heron's family recently with the hatching of their little ones. After the new millennium, domestic ducks were introduced to the lake much to the delight of locals and visitors. Even though their ancestors are several generations removed now, it is a daily event to see them crossing Lakeshore Boulevard to be fed by residents. Because of the ducks' food pilgrimages, motorists are urged to practice caution when traveling this route. It is not unusual to witness a mother duck crossing with as many as sixteen chicks trailing behind. The darting in and around of blue birds is quite common. Birds naturally love the lake and understandably, Lake Jackson is getting attention from bird watchers across the nation. Fishing: Great fishing abounds in Lake Jackson with the coveted large mouthed bass population and followed closely in numbers by shell cracker, bream and crappie. During the annual 24th of June Celebration, a fishing tournament is held and bragging rights are established for at least a year. Fishermen and women team up to win the trophies for most fish caught and the largest. To date, several bass in the ten pound range have been caught by proud fishermen. Alligators: As with most bodies of water in the southeast US, Lake Jackson is home to the alligator. When one frequents the swimming sites or if the alligator exceeds a certain length, it is captured and relocated by state park officials to a more appropriate body of water. Cypress Trees: The cypress trees are indigenous to the area and most are estimated to be over one hundred years old. The natural enhancement of Spanish moss, also indigenous, is rivaled in beauty only during the fall when the cypress needles change to a shocking orange hue. Waypoint #001--Florala Wetlands Park: This educational and preservation effort was established in 2000 under then Florala mayor, Glen Zorn. Placards noting the various forms of wild and plant life generously dot the route. Wetlands are nature's way of cleaning the water and this park educates visitors the importance of the protection of wetlands. Take a stroll through here and quiet yourself. 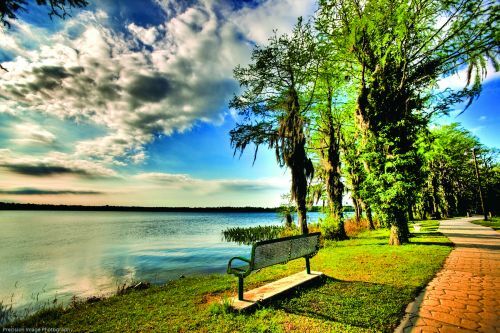 Listen to the chirping of birds, the splashing of perhaps a record bass, the song of rain frogs and the hum of happy insects which all play a part in keeping Lake Jackson's waters beautiful and safe for recreation. The first waterless toilet to be erected in Alabama was added to the Wetlands Park in 2007. This unique feature further provides a needed function while maintaining the sanitation of the park. Waypoint #005-- The Florala Boat Launch and Park provides a place to unload your boat, then park your trailer. The two dollar fee for its service funds the Florala Recreation Board as well as the parking area's upkeep. During the development of the Wetlands Park, a cobblestone path was created here to connect to the Trail of History. Waypoint #006--TR-938: This fighter jet was donated by nearby Eglin AFB after the plane was retired from its use as a training unit during the Vietnam War. Walk up to the plane and let your imagination take you to the young men who learned to fly war craft for our country in its cockpit. In honor and in memory of the United States' finest, its military, Florala is humbled to be home to such a magnanimous piece of our nation's history. Waypoints #007 and #008--Amphitheater/Conference Center: Its building site is where the Chautauqua Building of antiquity existed almost one hundred years prior. The State of Alabama Division of Parks and Recreation awarded a one million dollar grant to Florala State Park and the US Air Force's IRT matched the funds with labor resulting in much needed improvements to the park. With the generosity of the IRT, the project size more than doubled. The amphitheater and conference center will seat five to seven hundred. Across the street from Waypoint #008-- Wachovia Bank Building was built in 1981 and strongly replicates the Colonial Hotel which was situated in the same location. Sadly, the hotel was destroyed by fire in 1966. Waypoint #009-- The Florala Ladies' Clubhouse, circa 1933, was built by the WPA. Beginning with the charter members of the Florala Study Club, this facility was the meeting place for ladies' clubs. Through the years as more clubs were federated, the clubhouse was host to the town's monthly club meetings. With the expansion of the park, the clubhouse was slated to be demolished but the State of Alabama graciously allowed the building to be relocated. It is now undergoing extensive renovations and will no doubt enjoy its new life at the corner of Fourth and Wildflower. Franklin Ferguson Company--Between Highway 85 and Tyner Station, you will notice several large domed buildings. These were originally Franklin Ferguson Company, Florala's largest textile manufacturer until 1988 when it sold to another company. Presently, there are other businesses housed in the structures, one a successful asphalt shingle company, in another an equally successful elevator company and in yet another, a popular warehouse flea market style shop. Colonel Percy McClung Building (SE corner)--Of interest is the Colonel Percy McClung Building, referred to by the locals as the "old armory." This facility was named for Florala resident, Colonel Percy McClung, and functioned as the site for Florala's unit of the Alabama National Guard until the 1970's when a new complex was built on Highway 52. Today, the old armory proudly wears many hats as it is the local voting precinct, the location of monthly bingo games, numerous fundraisers and is the meeting place for the Tri-Cities Chamber of Commerce. Tyner Station (Old L&N Depot) (NW corner)--The L & N Depot was constructed circa 1906. The original depot was built in 1904 and was destroyed by fire, hence this 1906 structure's origination. During the time of construction, operations for the L & N were housed in a box car much like the one on the grounds today. The L & N was one of two depots in Florala with Central Georgia operating from a depot where Tom Thumb is today. Florala residents are deeply appreciative of the Florala Historical Society for their hard work in renovating the depot to its current condition. In the 1990's, the building's name changed to Tyner Station in honor of the project's generous benefactor, Edna Tyner. New life has been breathed into this building as it has held weddings, receptions, parties, fundraisers and political functions since its rehabilitation. Waypoint #011--The Lake House Bed and Breakfast: Built in the 1800's, the Lake House is one of the oldest houses in Florala; this was a private residence until the 90's when local proprietor, Inez Henderson, acquired the house and renovated it as Florala's first bed and breakfast inn. The current owners, Lee and Caroline Holloway are parents of Josh Holloway, a star of the hit television series, "Lost." Waypoint #012--Manning's Landing: Ed Manning was an early postmaster in Florala and so beloved by all that the landing was named for him. He resided in a home in "Old Florala" and was a devout fisherman. One can imagine this as the fishing spot where Ed cast his line because of the close proximity to his home. Today this is a favorite hangout for local boating enthusiasts and the landing just might be the premier spot from land to enjoy one of the fabulous sunsets over the lake. Many a fish supper has been caught from this spot. Waypoint #014-- The Florala State Park Campground: Constructed in the 1980's, the addition of the campground brings repeat and new visitors throughout the year. Local residents cherish the friendship of these campers and anxiously await their arrival. There are twenty-two sites for campers and an area for tent campers as well. The First Presbyterian Church (23492 5th Avenue) was built in 1929 for a sum of twenty-nine thousand dollars. The lovely Crusader Gothic building is one of three churches of like style in the state with the other two being in Atmore and Wetumpka. The manse was constructed in the 1940's and the 1950 purchase of the private Hughes residence adjacent to the church added facility for a much needed fellowship hall and education rooms. The First Baptist Church (23593 5th Avenue is a fine example of Greek Revival architecture. The church was designed and built in 1920 by Dr. N.O. Patterson, an architect, who was also the pastor. At its completion construction cost was thirty-five thousand dollars not including the four thousand dollar purchase of the pipe organ. It has twenty-eight rooms and seats eight hundred in the main auditorium. The church is situated on Florala's highest point. A crowning feature of the church is its exquisite stained glass windows. On your walk you will pass a private residence and catch a glimpse of another building both designed by Dr. Patterson; see if you can guess which they are.